The tops of our 1015 sweet onions are beginning to lean over. They are ready to harvest. These onions are very special. When I told a chef friend of mine that we have 1015 onions in the garden, she became very excited and demanded exclusive rights to all our 1015 forever. Then she told me about her love letter to the onion man. 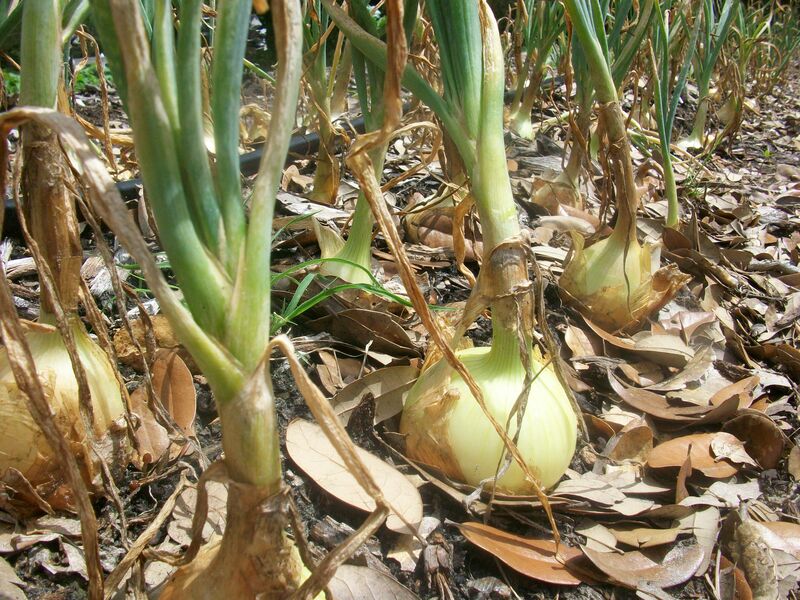 Commercial onion production in Texas began around 1900. In those days, the onion seeds were imported from Teneriffe in the Canary Islands. Soon, Texans began to develop and improve their own onion varieties. The Grano, known as “the mother of all onions”, was developed by Texans and became the world-class standard for onions. Today, onions are Texas’ leading agricultural export. In the 1960’s, an agricultural scientist from Texas A&M developed his own unique variety of onion. He named the variety 1015 to remind farmers to plant them on October 15, so they would be ready to harvest in June of the following year. His name was Dr. Leonard Pike, the onion man. Dr. Pike created possibly the best onion in the world. Back to my friend, the chef: She discovered 1015 onions when she owned a restaurant in Manhattan. She absolutely loved the 1015–the layers of flavor and sweetness that come alive when these onions are grilled or sautéed. The sweet onions from Texas were very popular with the sophisticated diners in her New York restaurant. The chef loved the onions so much that she sent the professor a love letter! I didn’t see the letter, but knowing my friend it was a little bit racy (probably very racy). Sadly, the professor never replied to the beautiful young chef in New York City. He retired from A&M years ago and is now a part of Texas history. I’m not sure how much fan mail the professor received, but I suspect he kept the love letter for his 1015. We planted our 1015 right on time and have nourished them in the Rockport sun and soil for seven long months. These onions are very special, and they will go fast. Come try the onions that inspired a love letter! We deliver our farm fresh food to your door in Rockport (minimum $20 order). Or, look for the Four String Farm booth at the Rockport Farmer’s Market. Or come out to the farm and pick the onions yourself!